This morning's weigh-in: 210.5 - back down from last week's 3 pound gain, plus another half-pound. I told you it was water retention. I didn't end up making it back to the gym last week after all. CoWorkerB was out with strep throat the first part of the week, and I started feeling like I might have caught something on Tuesday. Thankfully it never got too bad, just a little feverish and a somewhat scratchy and swollen throat for a day or two. And I procrastinated the Weigh Down workbook thing again. I have to get it out of the trunk of my car and put it by the computer so I will remember to do it when I have time. All in all, a good week considering the fact that I am still not back into the swing of working out regularly. Here's hoping for an extra-good week this week. Well, that was not so good... I weighed yesterday and the scale told me that I was at 214 - not only "no progress", but I gained back everything I'd lost the previous week. Although I didn't get to the gym Wednesday and Friday (too many late nights, headaches, etc.) I didn't feel like I did that badly on the food front, and Aunt Flo is due to visit any day now, so I suspect most of that is from retaining water. This week I'll be working on getting back to a normal sleep schedule and getting back to the gym - once I get out of the habit, it's a real struggle to get back into it. Other than that, I expect the rest of it will take care of itself - unless, of course, I turn out to be pregnant, which after two years of no luck would be a pleasant surprise indeed. OK everyone, how'd you do? As I mentioned on Monday, last week I lost 3 pounds... Hubby-head again didn't post, but I watched him weigh and he lost 2-1/2 pounds last week (close! and still making progress!). SusiePie left a comment that she lost 2 pounds last week - back on track! Mom didn't get a chance to weigh, she had a very tough Sunday and Monday with the husband of one of the women she's been discipling passing away. I'm sure she's done great, though. My goal is to lose another 2 pounds, and to get into that workbook as I keep promising myself. Hubby-head's goal is 3 pounds, and either to go to the doctor or come to the gym with me *grin*. For those who are still considering joining up, please do! 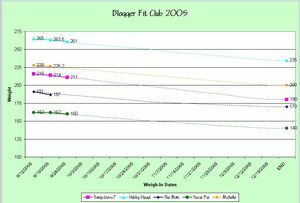 This round of Blogger Fit Club lasts until December 20, and then I'm still thinking I'll do Round 2 after the New Year. Fit Clubbers, don't forget to check in on Monday with your weigh-in! Have a great week! This morning's weigh-in: 211 pounds - I made my goal! I didn't make it to the gym on Friday morning (just toooo sleepy) but I feel like I'm getting into the swing of working out again. I'm not sore all the time. I actually feel good after I leave the gym. It's a beautiful thing. And then I'm doing better about not eating out of boredom and not overeating as well. I still haven't started going back through my workbook - procrastinator that I am - and I think that will help my focus even more. So a good second week here... how did everyone else do? I made my goal - losing 2 pounds, and getting back into the swing of working out. Hubby-head didn't post his weigh-in results, but I watched him weigh on Monday and he lost 1-1/2 pounds, putting him at 263.5. His back and neck have been bothering him, which has kept him from joining me on the morning workouts... but for the first week, I'd say we're doing good. 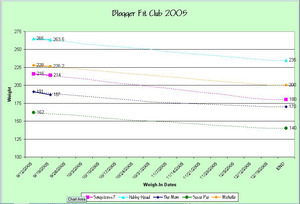 My mom e-mailed me her results, which were amazing - she lost 4 pounds with diet alone. I'd say she might just outpace all of us in this competition, even though she was thinking she might not lose much. Her current weight would be 187. SusiePie didn't post her weight this week - but according to this post she had an excuse: a weekend with her parents, replete with tempting foodstuffs. Her sidebar puts this week's weigh in at the same as last week: 162. Michelle joined us mid-week last week, and she posted her weigh-in in the comments here. Nearly 2 pounds lost - a good start! My goal is 3 pounds, to keep with the Monday/Wednesday/Friday morning workout regimen, and to start working through that Weigh Down workbook again. Mom's goal is 2 pounds. I'm sure she'll zoom right past it, the way that first week went! And Michelle's goal is also 2 pounds. All right folks, let's stay on track and have a great week! Check back in on Monday with your weigh-in! This week's weigh in: 214 lbs. What went well this past week: I made it to the gym Wednesday and Friday morning (this morning too). I did a lot better with not eating out of boredom or "because it's dinner time", and with stopping before I was stuffed. What could go better: I didn't manage to sit down and review my Weigh Down workbook this past week, and I'd really like to do that. There were a few times when I felt myself getting satisfied and took the last couple of bites anyway because my portion was almost gone - that I need to work on... and I need to be more conscious about not taking in a lot of calories with beverages (i.e. Starbucks, lemonade, *cough*sangria*cough*) because most of the time I will still need food to satisfy my hunger. All in all a pretty decent start... how'd everyone else do? Things I didn't need to overhear while walking through the break room: "I've got this rash..."
Soaring real estate prices in the Metro Phoenix area means one thing to me: Two years ago I could have bought my 3,300 square foot dream house in a new development in Laveen for $190,000. Now I'll be lucky to find a 1,500 square foot fixer-upper anywhere within 20 miles of here for that price (unless it's in a really scary neighborhood). And I still can't afford $190,000 anyway, at least not without planning to work full-time for the next 30 years to pay it off and still have money for anything else. This is starting to feel like L.A..
Getting up at 4:45 AM to work out has been interesting. I can't say I like it, although I do like how I feel afterwards, and I like the fact that 1) the gym is not as crowded at that hour, and 2) Starbucks isn't as crowded at 6:00 AM when I'm done working out. Being a night person, I find I have to set an alarm on my cell phone to remind me (in case I'm engrossed in something else) at 9:30 that I need to start getting ready for bed. I don't like going to bed before 10:00 PM either. It feels like the evening is too short - I get home from work around 6, and if I make dinner, that's 7:00 or 7:30 before we're done eating and cleaning up... sometimes even 8:00 if I made something really involved. If I go to bed before 10, that leaves me around 2 hours or so to do anything - blogging, playing games, watching TV, doing laundry, practicing the piano... all that good stuff. Ahh well, the life of a night person stuck in a morning person's world. And now, I must be off. I have a party to attend tonight at FormerBossMan's house, along with my favorite ex-coworkers and some folks who were involved in my last project. The menu includes sangria and gourmet pizza. Looks like we're in for a lovely evening. Over at mountaineer musings, the lovely and talented SarahK has decided that she really dislikes her job. In fact, she really dislikes public accounting, which she's been doing for a while now. So, not only is she quitting her job, she's taking the rest of the year off to plan her wedding (all hail Frank J.!) and work on the IMAO podcast and such. There are days when I am envious of her short-timer status. But then, I'm making a concerted effort right now to pay off bills and get ready to sell our condo and buy a more suitable place... Working toward the day when I too can afford to say "You know what? I don't like this job." and go do something else. Like what? Baking cakes, perhaps. Or doing voiceovers - something my radio and theatre training would be useful for. Yesterday I was all set to post a rant about politics - my view of the proper role of the federal government, state and local governments, as well as charities and free enterprise... but I got busy at work and lost the drive to put my thoughts down on virtual paper. Sometimes I'm interested in politics, and sometimes it just annoys me. Today, for instance, CoWorkerK was about to launch into a full-blown rant of his own about the fact that Halliburton has already gotten some of the rebuilding work in New Orleans. I pondered for a moment jumping in to remind him that President Clinton awarded no-bid contracts to Halliburton for work in Kosovo as well, but then I thought "eh, what good will it do?" It'll just irritate him, and personally I prefer not to get into political and religious arguments with the people I work with. If they are interested in having a civil conversation or debate, that's one thing - but if they're angry and spoiling for a fight, I'm staying out of it. So I went back to my PCO review, and he got distracted looking at a brochure for some conference or another. Sometimes I feel disingenuous about letting him ramble about whatever anti-Bush bent he's on that day, figuring he assumes I agree with him. I've just found that the vitriolic Bush haters won't be swayed by whatever argument you can present, and if you have to continue to deal with them on a regular basis, it's easier to keep the peace by not responding at all. Ohh, my pecs. I had my first trip back to the gym yesterday. I took it easy on myself with the weights, using less resistance than I remember using last year, although with a few more reps (broken into two sets). I think it was the military press that did me in. Dang, lifting my coffee cup to my mouth hurts muscles I didn't know I used for that particular activity. I got in a good 30 minutes of cardio, between the recumbent bike and the treadmill. Heart rate to 149+ for most of that. I would have gone back this morning for more cardio, but Hubby and I were out late conspiring with some of our friends from church on pranks we could play. When we get our heads together, we can be positively evil. I'll share after the plans are carried out - don't want to tip our hand too soon here. In any event, we didn't intend to be out as late as we were, but the discussion continued out into the parking lot and past 11:00 PM. I was in no shape to get out of bed at 4:45 AM. Aaaaaanyway, enough of the rambling. What's on your mind today? 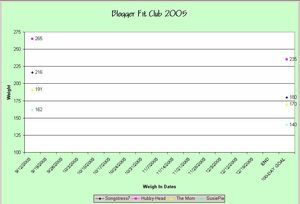 Blogger Fit Club - Here We Go! At the risk of this blog having nothing but weight-loss posts (I promise I will make an effort to talk about other stuff, really)... Here we go with the first week's roundup. As I've said before, anyone else who wants to participate after we've started is more than welcome - just leave a comment and I'll add you to the chart. *putting on my Drill Sergeant Harvey costume* All right folks! We're all out of shape and (except for Susie) out of practice in paying attention to what, when, and why we're eating. I'll be easy on you (us) this week to get you into the swing of things. All of us will have the same goal: to lose 2 pounds. If we put our minds to it, we can do it! Check back in Monday for the Week 2 weigh-in!